Can thousands of little guys capture more CO2 faster than a few, massive emitters? That’s the central idea behind Austin-based startup Earthly Labs. To explain: Most of the action in carbon capture technology has focused on large-scale CO2 emitters, like fossil fuel plants. But for serial entrepreneur Amy George, the better approach is to think smaller. Specifically, through her startup, she’s created a technology for small companies that also allows them to capture, purify and reuse carbon dioxide. About half of CO2 emissions are from such sources, according to George. “I’m trying to tackle the problem from a different angle—miniaturize the technology so more of us can do our part to make a difference,” she says. The company’s first target is the more than 17,000 craft breweries around the world. In the natural beer-making process, breweries emit carbon dioxide while, at the same time, buying commercial CO2, which is delivered in trucks, to carbonate and package their beer. But that fermentation process, George discovered, emits about the same amount of CO2 as breweries consume. So if companies can purify and reuse CO2, they can not only reduce their CO2 purchases substantially, but also protect the environment, according to George. 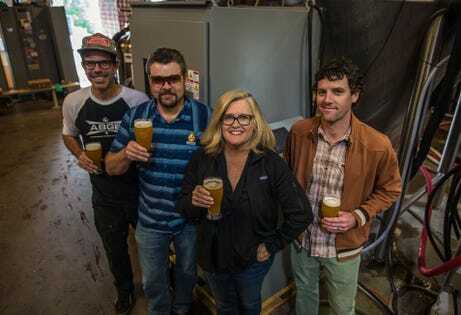 “I realized that, if we could close the loop on that beer-making process and save breweries money at the same time, it would be the perfect place to start,” she says. The craft brewing industry emits nearly half billion metric tons of carbon dioxide a year. George got the idea for Earthly Labs after cofounding BlueAvocado, which sells reusable storage bags, in 2007; in 2016, she took on a board of director’s role and started turning her attention to climate change, hoping to find a way to put more power in the hands of small businesses and individuals. “Like many people, I felt powerless,” she says. Her research led her to carbon capture and how to automate the process on a small scale and affordably for people “who are not chemical engineers by trade,” she says. Ultimately, says George, the technology lets companies do the right thing, while also getting a return on their investment. Businesses see a payback in two to three years, according to George. What’s more, the technology is likely to be a plus in the eyes of eco-conscious consumers. A recent study by researchers at Indiana University found that most beer customers are willing to pay more for sustainably produced ale. An added feature: The system also lets breweries track in real-time how much CO2 is being captured per year, month and even hour. “We allow our brewers to share that information with customers and take credit for it,” she says. Ultimately, George plans to apply the technology, which is housed in a box containing hardware and software, to other markets that can capture CO2 and turn the waste into additional revenue streams. So far, financing has come through sales, personal funds and debt capital, along with a small friends and family investment.